All that is good begins with a SMILE. When you visit our office, your health & smile are our top priority. Dr. Naylor along with his entire team are dedicated to providing you with the personalized, gentle care that you deserve. Part of our commitment to serving our patients includes providing information that helps them to make more informed decisions about their oral health needs. This website is a resource we hope you’ll find both useful and interesting. Our ultimate goal is to help you and your dentist keep your natural teeth for as long as possible. 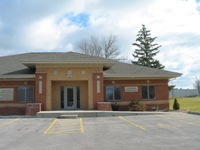 Our practice is located in Maryville, Illinois, west of Anderson Hospital on RTE 162. Please give us a call if you have any questions or would like to schedule an appointment at 618-288-1550. Maryville Periodontist Dr. David Kelsheimer is a professional dedicated to excellence in periodontics such as periodontal disease diagnosis & treatment, crown lengthening, scaling & curettage, night guards, dental implants & more. Come visit Kelsheimer Periodontics located in Maryville, IL.